Give yourself the gift of a polished look with this ring set from Apples of Gold. A 5mm peridot gemstone brings a pop of brilliance with its vibrant green color. The stone is set in yellow gold and mounted above the band. 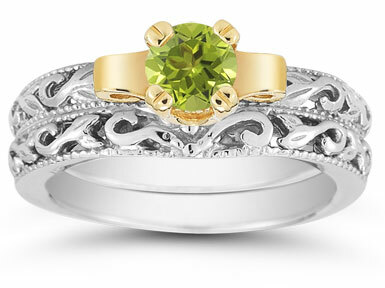 Two yellow gold swirls flank the peridot to create a dramatic effect. The ring set's two white gold bands offer a radiant white glow and highlight the elaborate carving, true to art deco design. Each facet of this peridot ring set is then polished to perfection, giving you just the right look. 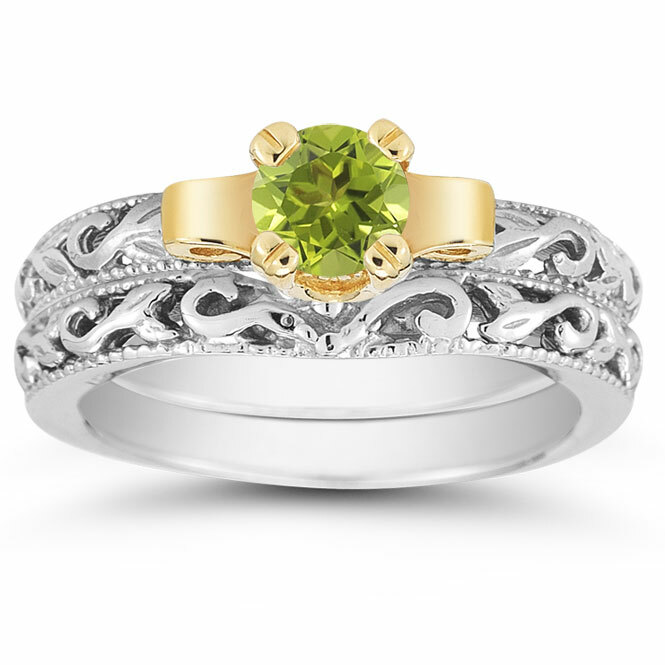 We guarantee our 1/2 Carat Art Deco Peridot Bridal Ring Set to be high quality, authentic jewelry, as described above.